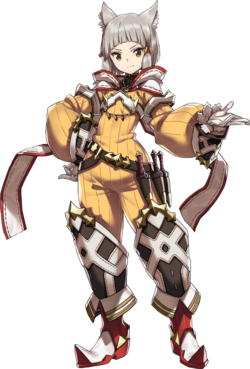 Nia (ニア, Niyah) is the tritagonist of Xenoblade Chronicles 2. Nia is a Gormotti Driver from Gormott Providence, accompanied by her Special Blade, Dromarch. Together they went on the run from the Indoline Praetorium until they were rescued by Jin and offer her to join his organization, Torna. During a salvaging mission with Jin, Malos, and Rex, when they reach a room containing the Aegis Pyra, she witness Jin kill Rex after touching Pyra's sword, prompting her and Dromarch to defect to the recently revived Rex's side and the first people to join him on his and Pyra's journey to reach Elysium. Eventually, it is revealed that Nia is a blade who was merged with the corpse of her former driver’s daughter. After the reveal, she can be freely switched between blade and driver forms. Nia set for the Mii Brawler. Nia’s driver form appears as a costume for the Mii Brawler. She also appears as an Ace spirit. Her blade form is completely absent from the game. This page was last edited on February 10, 2019, at 02:08.